Comic books, comic art and comic fellows! All comic related posts are here! Iconic but often cancelled, Norrin Radd makes a surprising return in Silver Surfer #1 from Dan Slott and Michael and Laura Allred. In a somewhat risky move, Slott reimagines Silver Surfer as a spacefaring traveler in a psychedelic universe of fun and adventure, abandoning the traditional themes of philosophic introspection that readers know this character for. This tonal shift is more in line with titles like She-Hulk, Doop and FF, whose focus on quirky characterizations breaks up the gloomy (and sometimes downright apocalyptic) nature of the rest of the Marvel Universe. Free from big events and dark storylines, Silver Surfer and its ilk are better suited for casual readers who just want a good read without the complicated drama of interconnected plots. This title in particular also clearly draws from the well-trodden adventure structure of Doctor Who, giving Norrin a female companion to take on his latest galaxy-hopping adventure. This all but ensures a peppier Silver Surfer, no longer doomed to roam the infinite ocean of stars alone. But the question remains: Does it work? Light and breezy, this iteration of Silver Surfer still sees Norrin wandering the universe, committing good deeds to atone for the horrors he committed as the herald of Galactus, but with a few changes. He largely abandons his dour nature for a sunnier one, complete with snappier dialogue and an understated sense of humor. A seemingly normal excursion brings him to the Impericon, an impossible deep-space city bustling with thousands of alien races. He quickly learns that he has been taken there to stop the Queen of Nevers and save them from her bloody quest, as many other defenders before him. Like those other defenders, the deceitful Incredulous Zed kidnaps the one person that Norrin cares for above all else to use as leverage in forcing him to complete the task. Zed then teleports a young Earth woman named Dawn to the Impericon to hold hostage. Left behind while her twin sister Eve travels the world, Dawn’s dreams of a life beyond her sleepy beach town remain unfilled by her job at her family’s bed and breakfast. However, she’s a total stranger to Norrin, who has no idea who she is or why she’s so important to him. So begin their adventures together. As promised, Slott and the Allreds deliver a lighthearted comic adventure abounding with quippy dialogue and kaleidoscopic settings. Their collaboration establishes the perfect tone for this lighter, brighter Silver Surfer, taking Norrin’s search for redemption into far more hopeful territory. This may alienate some readers, but the choice to makes sense given the direction that Marvel has been trending toward with its secondary character titles. The imagery is fun and inviting, even if Michael Allred’s style tends to flatten the space a bit too much for my liking. There’s some missed opportunities to really explore the size and scope of space, which is such a critical component of this series and its aesthetics, with some pages coming off as cluttered. Even for it, Silver Surfer #1 is a cool read with a promising future ahead of it. After months of buzz, the highly anticipated Ms. Marvel #1 is finally here, establishing new mythology as Carol Danvers passes her original title to new hero Kamala Khan. It comes from the creative team of award-winning writer G. Willow Wilson, known for her graphic novel Cairo and novel Alif the Unseen, and artist Adrian Alphona, best known for his work on Marvel’s Runaways. Debuting in early February to critical acclaim and fan fervor, at the time of this writing Ms. Marvel has already gone to a second printing as the Kamala Corp., Ms. Marvel fans who derive their fandom mantle from Captain Marvel’s Carol Corp., eagerly snatched this book from store shelves. And there’s a very good reason for the fervor. Joyous and refreshing, this title has everything a superhero book should: A strong mythos rooted in some of Marvel’s biggest titles, a popular forebear to pass her mantle to a new generation, and endearing young hero worthy of the task. More than that, this is a smart, relevant, and human title that has so much to offer beyond action and fantasy. The lure of this title is the titular character herself. An average sixteen-year-old from Jersey City, Kamala writes Avengers fanfiction, idolizes Captain Marvel, and loves all things superhero. A lot of readers already know how the story goes: Her life is boring, her family is a constant source of irritation, and she’s the target of the concern-trolling white kids at her school. Living vicariously through her colorful fantasies, she is the average young comic book fan personified, seeking escape from her humdrum existence through the world of superheroes. Not only does this instantly endear readers to the awkward but lovable Kamala, but as a Muslim woman, she also highlights views and experiences not too often seen in comics. While there has been a lot of progress with female representation in Marvel titles like Captain Marvel, Black Widow, and Journey into Mystery, Kamala does these books one better. She reaches out to a far broader audience that is often left behind in a sea of predominantly white, predominantly male protagonists. For that her arrival is very exciting for readers of all backgrounds, helping to develop a far more inclusive pantheon of heroes. After all, while Kamala is certainly not the only Muslim woman in the Marvel Universe, there is always room for more well-written characters, and she helps to bring another voice to that demographic. When concern-troll classmate Zoe throws a party at the local park, Kamala wants to go, too naïve to see the malice behind Zoe’s patronizing remarks. Despite her friends’ warning, she asks her endearing but conservative father for permission to attend, only to find herself banned from going. Wanting to go out and have fun like the “normal” kids, she sneaks out, only to find she isn’t really welcome at the party. As she leaves, the effects of the Terrigenesis bomb Black Bolt detonated over New York reaches the neighborhood, engulfing the city in mist. As seen in the pages of Infinity and the ensuing Inhumanity, Black Bolt’s bomb is activating the powers of Inhuman descendants in the human population, manifesting these latent mutations in violent chain reactions. Breathing in the mist, Kamala soon passes out, dreaming of her favorite heroes Captain Marvel, Iron Man and Captain America. Appearing to her like idols of devotional portraits, Captain Marvel tell her that she’s at a crossroads, set to decide what kind of person she wants to become. Kamala tells her that she wants to be beautiful, powerful, and less complicated, just like her hero. She wants to be normal, and with a final warning from her hero, gets her wish. Waking up from her vision she finds herself in a Terrigenesis cocoon. Panicked, she fights her way out of it, only to realize she’s been transformed into her role model. She’s certainly different, much to her surprise, but things are already looking more complicated than ever. Full of warmth, charm and colorful fantasy, everything about this book is enchanting. Wilson creates a loveable Every Girl in Kamala, giving her a full and well-rounded world to inhabit, complete with a quirky supporting cast and plenty of subtle New Jersey pop culture shout-outs. The dialogue is natural and well-written, striking an affective balance of humor and earnestness that makes Kamala a compelling protagonist. Bringing the script to the page, Alphona’s artwork is all the more engaging. His lines are airy and light, gently exaggerating the character anatomy to affect a soft, storybook-like quality. This skillful touch develops a fun and appropriately whimsical graphic narrative, one that fits the youthful tone of the story but still maintains a level of visual complexity and fullness. Colorist Ian Herring brings it all home through the use of soft earth tones and dreamy turquoises, contrasted by the deep blues and striking reds of Kamala’s vision and final metamorphosis. Their collaboration makes for a truly lush and inviting visual experience with a cohesive and strongly defined aesthetic. Living up to all the hype, Ms. Marvel #1 is a beautiful book from start to finish. A visual treat for readers of all ages, it establishes a hopeful new chapter in the Captain Marvel/Ms. Marvel mythology, as well as the Marvel pantheon at large. This is a must-read for fans both new and seasoned, full of a humor and humanity that injects a much-needed jolt of excitement and delight into the superhero genre. Give Kamala Khan the chance to steal your heart – I promise you won’t regret it. Having read and reviewed (and thoroughly enjoyed) the recent Moon Knight #1 from Warren Ellis and Declan Shalvey, I was curious to dig through some of my backlog to see if I had any other Moon Knight lying around. To be honest, my knowledge of the night’s greatest detective is cursory at best, having read only sporadic appearances over the last twenty years or so. However, when I came across Moon Knight Special Edition #1 I knew it would be fun to review now. Published in October 1992, this special edition one-shot, complete with a cover gallery and mini-comic, falls more in line with what I’d read of the character growing up, albeit in a far more joking tone. So if you’re looking for a nostalgic dose of 90s Moon Knight, look no further. Written by character creator Doug Moench with pencils by Art Nichols, Moon Knight Special Edition #1 follows the titular character as he teams up with martial arts master Shangi-Chi. Tasked with investigating a series of disappearances, this unlikely pair finds themselves embroiled in the strange world of the Golden Dawn mind-cult, which preys on young adults from their lair on a remote island. Populated by wave after wave of cartoonish, over-the-top obstacles and villains, the island and the cult that runs it are not exactly what they seem, much to Moon Knight’s growing frustration. The plot itself is as ridiculous and cheesy as the cult itself, but the long-suffering heroes are aware of it the entire time, putting much of the aggressive inanity into a sufficient context. Even for it, the conclusion feels a bit rushed and unresolved, adding a level of sobriety at the end that feels a little tacked on. Despite the somewhat uneven handling of the script, Moench injects some great dialogue into this overly silly romp as Moon Knight and Shang-Chi try to get along for the sake of the mission. Much of their strained dynamics result in some truly funny moments throughout the issue, adding some much-needed humor to the story through useful tension and expert delivery. The buddy movie sensibility definitely works to ground the issue in defined characterizations and narrative voices, following the heroes as they grow to eventually tolerate each other and their opposing styles. As for the artwork, Nichols’ clean page design and kinetic panel compositions carries this zany adventure to a satisfying end. As silly as the graphic narrative becomes, much of the imagery is compelling and visually interesting, making for a solid reading experience. The palettes of colorist Mike Thomas feel a bit muddy at times, especially during action sequences where character detail easily fades into dark amorphous backgrounds. Even for these rough spots, overall the colors are clean and effective throughout. The cover gallery and mini-comic are amusing and definitely worth a look. While the tone of book is a little inconsistent, the clever dialogue and strong artwork of Moon Knight Special Edition #1 make for an entertaining read. It’s classic exaggerated 90s comic book fare with all the nostalgia, both good and bad, along for the ride. Issues like this are worth revisiting after books relaunch if only to see how many directions characters have gone over the years, from serious to silly and back again. This may not be the strongest example of Moon Knight, but it’s a fun revisit to the bygone days of my childhood. 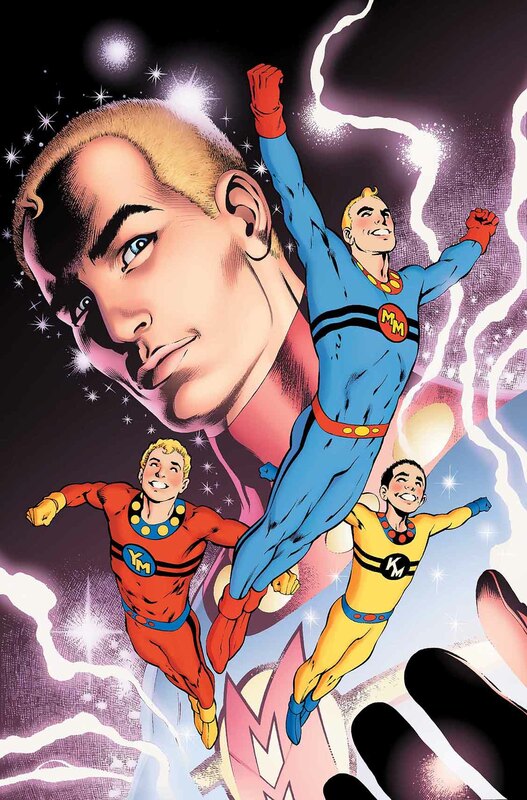 Marvel’s remastering of the deconstructionist classic Miracleman returns in its second chapter. This is second part of Book One: A Dream of Flying, with stories by Alan Moore and art by Garry Leach, Steve Dillon, Alan Davis and Paul Neary. #2collects reprints from Warriors #3 – #5, as well as reprints of original Marvelman adventures from creator Mick Angelo with art by Don Lawrence. As with #1, the backmatter features sketches and original artwork by Leech, offering a look into the production of the original Warriors serial. Picking up directly after #1, this issue follows the return of Jonathan Bates, the former Kid Miracleman, in When Johnny Comes Marching Home and Dragons. Now a wealthy cybernetics mogul, Bates has morphed into a pitiless sociopath, corrupted by the destructive powers he now hides behind the polished veneer of status and industry. Back at the Moran household Liz is still struggling to deal with her husband’s transformation when Mike gets a call from Bates, inviting them to his offices. When Mike and Liz go to visit Bates, their polite chat takes a sinister turn as Bates’ true nature rears it vicious head. With no other choice, Mike transforms into Miracleman to stop the ensuing rampage as Bates lays waste to everything in his path, putting London in danger. In the third story, The Yesterday Gambit, the Miracleman saga jumps three years into the future as Miracleman teams up with the alien Warpsmith to travel back in time. They arrive in 1963 on the day that the Miracleman family died, attempting to keep them from completing their fateful final mission. Young Miracleman dies and Miracleman loses his powers and memory, leaving Kid Miracleman alone to fester in his violent burgeoning tendencies. The resulting skirmish does nothing, however, as the family flies away to meet their inevitable death and Warpsmith wipes their memories of the event. In the end Miracleman and Warpsmith must return to their home timeline empty-handed, only to find themselves ambushed by Bates. This results in an ominous battle that alludes to dark days to come for Miracleman, past, present and future. Whether you’re new to the series or a longtime fan, Miracleman #2 is worth picking up. Moore’s writing is so lush and descriptive that it sometimes reads more like an illustrated novel than a comic, enriching the graphic narrative through the pure strength of language. He presents a bleak but fascinating view into the internal machinations of the superhuman, and how even the best of intentions can become corrupted by the nature of ultimate power and strength. Today such deconstruction of the superhero genre is so commonplace as to become tired, but for the pre-Watchmen 1980s, this stands as a fresh and engaging glimpse into superhero fiction. As for the art, Leech’s work, which for me is the real draw of the series, still holds up today through his command of page design and storytelling. His pencils are made all the more affective and intense by Steve Oliff’s palettes, bringing a new level of emotional subtly to the page through thoughtful color choice. While I was a little less engaged by the artwork in The Yesterday Gambit, it’s still a solid story and a good read, with a wealth of beautiful narration and great imagery. And be sure to look at the Marvelman reprints in the back of the issue, they are truly charming and a great deal of fun. As many of Marvel’s most beloved heroes return to the shelves with their own monthly titles this year, many ongoing books are renumbering with exciting new #1’s. Daredevil #1 arrived in March from writer Mark Waid, pencilist Chris Samnee and color artist Javier Rodriguez, embarking on a strong new chapter in this title’s long and dynamic history. While established readers will recognize this issue as a continuation of previous storylines, but with Waid’s tight scripting and Samnee and Rodriguez’s energetic artwork, Daredevil #1 offers a strong draw to new readers. Matt Murdock has come to San Francisco to begin the next chapter of his life with a new set of mysteries and adventures. Helping the San Francisco police with a kidnapping case, Daredevil takes to the streets to hunt down the abductors himself. Far from New York City, Matt’s a little out of his element, seguing into a summary of his origins for new audiences as his rescue mission brings the attention of one of the rocket-propelled kidnappers. The girl in his arms, Matt engages in an aerial pursuit across the city, facing danger and distraction at every turn. When he attempts to comfort the girl his senses pick up the sound of an explosive microdevice in her stomach, turning the high-flying chase into a race against time to save her. What begins as a fun done-in-one adventure opens up to a brand new mystery as the issue closes on the dramatic return of Foggy Nelson. With its fast-paced action and sharp dialogue, Daredevil #1 proves to be an exciting opening issue. Waid delivers a satisfying read that builds on the foundations he’s already established, catching readers up quickly and offering a nice introduction of Matt’s continuing adventures. With such a seamless transition from one leg of the title to the next the renumbering seems unnecessary, but even for it this #1 is a compelling read. Samnee’s strong sense of storytelling carries the book through clever and engaging page design. His artwork is as fun as it is absorbing, effortlessly navigating the equal measures tension and humor throughout the script. Rodriguez’s flat bold fields of color affect a strong balance of vintage adventure comic sensibility with the bright dynamism of this altogether surreal sensory world that Matt operates within. Their collaboration make this book a frenetic, funny and highly entertaining book. Action-packed, well-plotted and wonderfully executed, Daredevil #1 is a strong offering from a successful creative team. Longtime readers will appreciate the strong continuity, and new readers can quickly catch up and enjoy what storytellers Waid and Samnee have in store. Even if you’re new to the Man without Fear, this title has an easy learning curve and is easily accessible, and I can’t recommend it enough. Coming to screens in April, Captain America: The Winter Soldier is pulled from the pages of the award-winning Winter Soldier storyline by writer Ed Brubaker and artist Steve Epting. 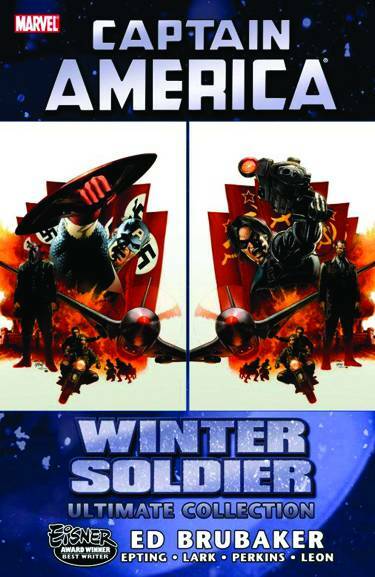 Spanning Captain America issues #1-9 and #11-14, Winter Soldier is a fast-paced spy story that changed Cap’s status quo forever. Aided by artistic team Mike Perkins, Michael Lark and John Paul Leon, Brubaker and Epting reenergized the Captain America mythos in the introduction of the arc’s titular character, reviving Cap’s dead partner Bucky Barnes as highly-skilled Soviet assassin the Winter Soldier. Full of action, intrigue and poignant character development, this saga lives up to the hype as its movie adaptation makes its way to a theater near you. Since the end of World War II, Soviet Russia has used its secret weapon, the ruthlessly efficient and untraceable Winter Soldier, to assassinate key Western political figures. Deactivated at the end of the Cold War, this undercover agent is once again revived by the power-hungry General Lukin and used to do his dirty work. Lukin, who has come into possession of a vastly powerful and reality-bending Cosmic Cube, embarks on a plot of death and destruction that brings Captain America to his door. Cap, still reeling from a series of recent traumas, is in no shape to come face to face with Bucky or the horrors that have been done to him. What begins with the surprising assassination of the Red Skull ends in a globe-trotting spy story of regret and redemption as Cap struggles to save his best friend from himself. Brubaker is a masterful storyteller and his gift for plotting really shows in Winter Soldier. His scripting throughout the arc is air-tight, settling into a compelling pace and never letting up as every component of the unfolding mystery seamlessly comes together. While certainly action-packed, the globe-trotting adventure is elegantly tempered by flashback sequences and downtime, slowing down to afford some truly poignant moments. The interlude, The Lonesome Death of Jack Monroe from artists Leon and Palmer, chronicles the tragic last months of Jack Monroe’s life as his mind begins to slip as result of the Super Soldier Serum. Likewise, Cap’s flashbacks to the 1940s, as well as the development of Bucky’s experiences as the Winter Soldier, create a strong personal undercurrent to balance the story effectively. However, while I enjoy Brubaker’s work, I find that his characterizations are often quite thin. Winter Soldier, unfortunately, is no exception. The somewhat generic dialogue feels a bit tired throughout, as Steve recycles uninspired lines plucked right from equally uninspiring action movies with a blandly flirtatious Sharon. This is a little irksome, but, compared to the rest of the compelling character drama, ultimately doesn’t detract from the enjoyment of the story. I just wish some of the emotional weight reserved for Bucky’s and Jack’s storylines could have been a little bit more equally distributed among the rest of the principle cast. Epting, who handles the bulk of the artwork, brings the story to the page with energy and gravitas. His strong sense of narrative truly shines through the use of thoughtful page design and panel transition, expertly pacing each critical scene. The quality of his lines and dramatic use of shadow sets a somber tone that grounds the story in a real sense of weight and physicality. Overall his style meshes impeccably with Perkins and flashback artist Lark, making for a cohesive reading experience from start to finish. This is also due largely in part to the work of colorist Frank D’Armata. D’Armata’s dark and moody palettes affect a somber tone throughout, and the use of grayscale color schemes during the flashback sequences is a nice touch. Overall Winter Soldier is a great story from a dynamic creative team. It’s fun, it’s compelling, and it’s wonderfully crafted from start to finish. This arc is required reading for Captain America fans but I highly recommend it to anyone looking for an exciting superhero read. Oh, and be sure to see the movie. I hear it’s pretty good. With its fourth issue, this 80s action-adventure romp comes to a dramatic close, ending this enjoyable flashback on an overall high note. After Logan’s apparent death at Alex’s hands, the spy/mercenary Quark uses her blooming romantic relationship with Alex to lead him to India and directly into the clutches of General Meltdown. In this issue we learn that this globe-trotting journey has been a complex rouse created by Meltdown and Doctor Neutron, meant to pit Alex against Meltdown so that the general can absorb Alex’s devastating radioactive blast. Logan, however, has other plans. After being buried in a shallow grave, Logan comes back as Alex predicted thanks to his healing factor. From there he follows the staged clues left behind by Quark to arrive in India, at the power plant meant to serve as the stage of General Meltdown’s ascension into untold levels of power. Led by Quark, Alex believes that he’s rushing into the plant to avoid an impending meltdown, and is instead met by Meltdown. Dramatic monologues ensue as Alex squares off against the power-hungry mutant, as Quark (still masquerading as Scarlett) is wounded in the skirmish. Fueled by heartbreak and rage, Alex unleashes a massive blast on Meltdown, playing right into Meltdown’s hands. Just when all seems lost, Logan arrives to stop Meltdown, piercing him with a slew of control rods as to dampen and wither his powers. Still channeling excessive levels of power, Alex redirects the radioactive onslaught up and into space, sparing the plant and everyone inside. With Meltdown dead and Scarlett seemingly lost in the crossfire, Logan and Alex make their escape to Bombay, taking a moment to breathe as their adventure comes to an end. In the epilogue we see Neutron plan for the future, quickly overcoming this setback to move onto the next big scheme at the expense of the world’s superhero community. Overall this was an enjoyable series, with plenty of twists and turns and amazing art to boot. In this closing issue Muth and Williams deliver a visually exciting story, with explosive action sequences in the Alex/Meltdown showdown and dramatic page design. The use of color was especially affective here, with lovely golds and earth tones against eerie blues and greens to explore the interior of the plant. This book is just unquestionably nice to read, providing a consistently engaging visual experience from start to finish. I wish I could say the same of Walter and Louise Simonsons’ scripting. While definitely fun, this issue in particular really suffers from the overuse of cliché dialogue and exchanges between Alex and Quark so sugary-sweet as to induce a diabetic episode. I have to give the Simonsons props for an entertaining plot for Muth and Williams to capitalize on, but the dialogue is often so bad that I had to laugh, and not in a good way. For all the soft spots, Havok and Wolverine: Meltdown is still a highly entertaining nostalgic trip to the comics of a bygone era.